Based upon its name alone, you would imagine Sea Life Park only featured marine life or ocean animals. But, as I found out on a recent trip there with my three children, the park’s aviary is really the star attraction. Located just ocean-side of the park’s jungle-gym, the aviary is a fully-interactive experience (that’s also covered for sun-protection—an added bonus) where visitors can experience what life might be like inside a giant birdcage. 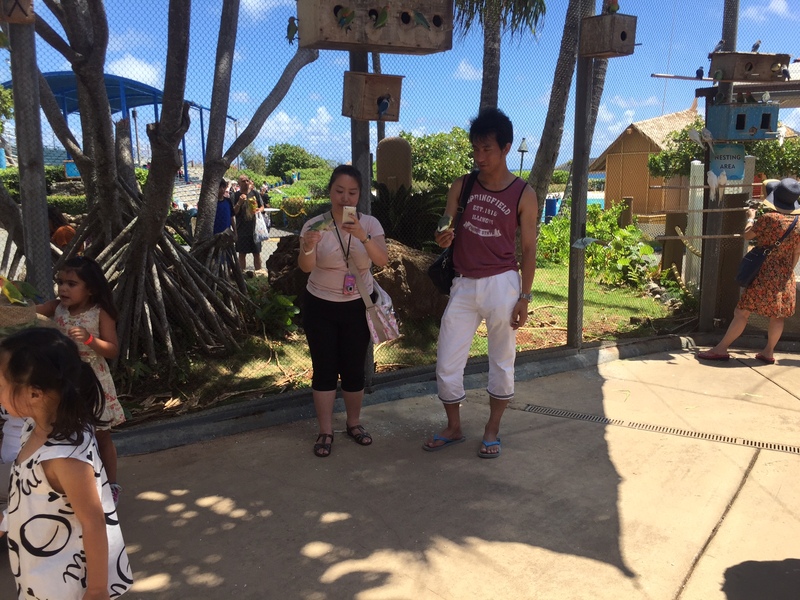 The exhibit is open-air, as well, and large enough to allow all the enclosed birds plenty of room to fly. Most of the birds are friendly and happy to steal a bite from a visitor. Upon entering, a host handed us a popsicle stick covered in birdseed and, essentially, set us loose! Then, it was up to us to decide which hungry birds deserved a nibble from our stick. Would it be the friendly and assertive lovebirds? Or, the laid-back, timid cockatiel? Turns out, we didn’t choose the birds—the birds chose us! All we had to do was stand a few inches away from a group of birds, and, within minutes, the hungriest of the bunch would swoop down, land on our sticks, and begin eating. And, they didn’t stop there. It wasn’t uncommon to see a bird or two hitchhiking on backpacks, hats, or even heads! To make the experience even more thrilling, the aviary host was nice enough to allow my children to hold some birds in their hands and pet them. And, according to the exhibit host, my children aren’t the only ones who think the aviary is the park’s star attraction. He says he knows many visitors who buy season passes just to come to the exhibit. 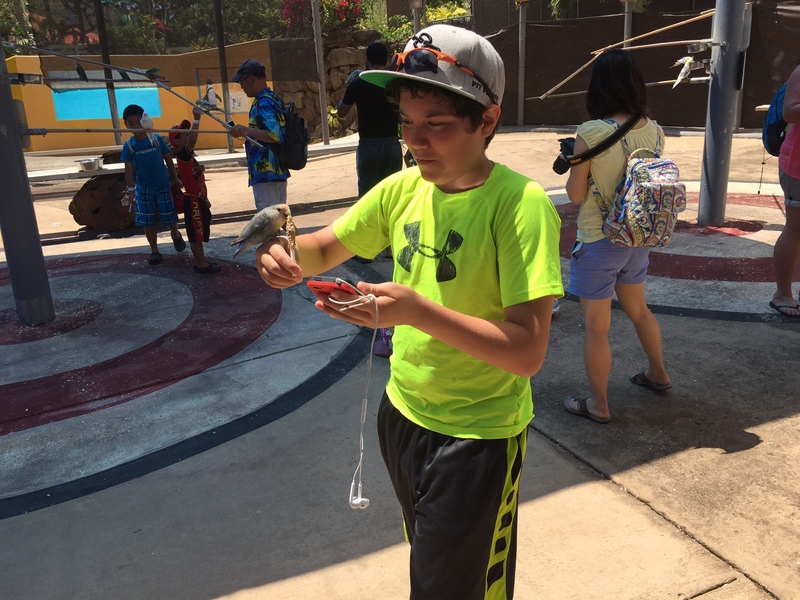 The aviary is a great spot for that vacation selfie. According to Jeff Pawlawski, the park’s curator, the aviary is home to more than 400 birds. But, when the exhibit opened in December 2012, they had fewer than 150. Pawlawski attributes the dramatic population explosion with an aggressive breeding program that helped expand the exhibit. In fact, the aviary features a “nesting area” in which couples can build nests, lay eggs, and rear their chicks (these couples seem more interested in stealing hat-strands for their nests than eating birdseed, as you can imagine). Although the park is open daily from 9:30-5:00, the aviary is only open from 10:00-12:00 and 1:00-3:00. However, Pawlawski says the park may soon expand the aviary’s hours, as soon as they have more available staff to host the exhibit. But, there’s good news for visitors hoping to control costs: The aviary is free with the cost of admission (at least, for now). More good news? I’ve learned that even a place with a name like Sea Life Park isn’t just about sea life—it’s so much more.